This weekend we welcomed a new arrival to the ranch: O.J. the wobbly cat. She came to us from the Bitterroot Humane Association in Hamilton, Montana. Diane M., who volunteers at the shelter, had contacted us about O.J. and then drove her out to the ranch. O.J. has cerebellar hypoplasia, which affects fine motor skills and balance, but her case is much milder than our Wobbler Hall of Fame inductees, who include Wobbles the cat and Allie the Lab/Retriever mix. Although O.J. doesn't flop like they do, she does have a pronounced head tremor. 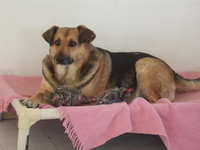 Like all our wobblers, though, she is very sweet and very affectionate. Beth was out taking photos this afternoon for our summer newsletter when she happened to take this interesting shot of old, blind Peabody and blind Luke in front of Widget's House. The photo reminded me of the expression, "like two ships passing each other in the night." Peabody is in the "blowing the coat out" stage, where his thick hair just keeps coming out in tufts. The more we brush, the less difference it seems to make! The next day he always has more. Depending on the dog and coat, this can go on for weeks; the German Shepherds here seem to do this more often than anyone else. 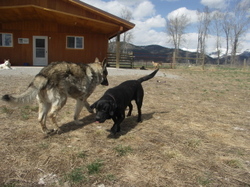 In the background on the left is blind Dusty enjoying a sunny spring afternoon. Before I get into today's topic, I just wanted to thank everyone who posted or emailed such wonderful and kind comments about Lonesome George's death yesterday. We were really touched by the heartfelt thoughts that were sent our -- and George's -- way. Thank you so much. Our equine vet, Dr. Bill Brown, was scheduled to spend the day here doing spring vaccinations and health exams on all the horses. 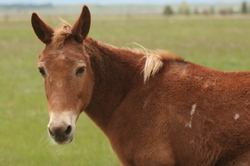 (I guess we can say "horses" now since George as a mule was the only non-horse equine at the ranch. And George never wanted to be confused with a horse, who he thought were all confused anyway, except for his sweetheart Lena.) So Bill and his vet tech, Vicky C., arrived this morning to begin a long 'herd health' day. 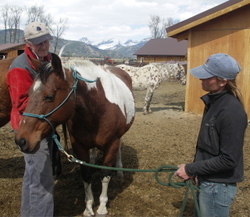 In the photo Bill is working on Patches, a Paint mare who came to us a few years ago from an animal cruelty court case in the Bitterroot Valley of Montana. A judge had turned Patches over to us for safekeeping until the defendant came to trial. When the case finally ended in a conviction a year later, the judge granted us custody of Patches. Kathryn is holding Patches, while Vicky was behind me keeping the syringes and other supplies prepped for Bill. That's Domino in the background, holding up the corner of the shed with his head. Domino is mostly blind but can still see a bit out of his left eye. Bill saved the strangles vaccine for last. Strangles is a highly contagious and nasty disease in horses affecting the lymph nodes of the upper respiratory tract. The vaccine is administered by squirting the fluid into the nostril so the horse absorbs it through the nasal membranes. Getting the vaccine into a horse's nose successfully is quite an art, and no one is better at doing it than Bill. In this video I shot a few minutes after the photo of Patches, Bill is giving the strangles vaccine to our giant Belgian draft horse Rooster. (The wind was blowing and unfortunately the microphone picked it up on the audio track.) At the end you'll see Rooster was showing me exactly what he thought about getting this stuff squirted up his nose. Our beloved old mule, Lonesome George, died today. Kathryn found him dead in his corral early this afternoon. She came to the door, in tears, to tell me. I rushed back out to the corral with her. There he was, laying on the ground, while his blind girls -- Lena, Nikki and Destiny -- milled around, unsure what had happened to their Uncle George. We moved the girls into the barn and then huddled with George. Yes, losing this little mule reduced us to tears. He was no ordinary mule. He was as cute as can be, easy-going, dignified, gentle, and adorable. He had an unflappable, dreamy nature about him ... an almost Buddha-like manner. He was a mule you could invite into your house and he would have ambled from room to room and never knocked anything over. If we'd ever had a cocktail party here, we could have pictured George mingling with the guests. George was ever so sweet with the blind foals he helped Lena raise. He never understood or appreciated why we turned him into a 'nanny mule' -- it was a role he didn't like but he performed so well. George could certainly be mule-ish, but in such an endearing way it made us love him even more. And he could dig a hole by the gate in an hour, pawing at the ground because he wanted out ... or in. It didn't matter, he pawed whenever he wanted something. We used to let him just wander around the ranch because he loved to explore. George never went far -- he cherished Lena and would hee-haw in distress if she disappeared from sight -- and he always stayed within view of the barn. Even yesterday morning we turned him loose so he could wander. Yet it was clear in recent weeks that he was losing his battle with cancer, despite the chemotherapy. His appetite had diminished and he started losing weight rapidly. He became "ribby" and bony, even while his personality stayed pretty much the same. So today wasn't a shock, but still an emotional jolt. Even when you're expecting it, you're never really prepared for it. Beth soon joined Kathryn and me at George's side. I called Alayne, who was in Missoula, to tell her the sad news. Then we set out to bury George. His grave is close to the barn, so he'll still be able to keep an eye on his girls. We loved this old mule. We still do. I went over to Widget's House this evening to take some photos for tonight's blog ... I didn't have any particular story in mind, just thought I'd see what I might get with the camera. Kathryn had just arrived inside to start getting the dogs' dinner ready, so I stepped into the back paddock. 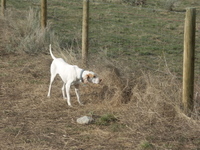 There was our deaf Pointer, Tyler, on the search for bugs or flies or just about anything he could chase through the air. Sometimes if a bug is crawling up the wall of the building but it's out of reach, he'll stand there staring at it, fixated on the tiny moving creature. That's Beth's cottage in the background behind Cedar. Oh, and then we have Levi. Levi went blind from trauma ... the blood in his eyes indicate he was beaten ... and as a result he has a really bad submissive urination complex. 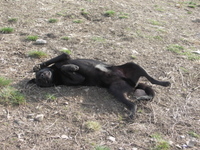 I would like to tell you this photo was of him rolling around in happiness, but no, he was being submissive because I had just told him "Off! Off!" when he jumped on me. He's a very energetic jumper, and any correction sends him into his submissive mode. Despite this, he really is a very joyful character and loves being with his friends. And finally, back inside Widget's House, was Libby. 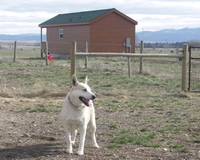 She's one of our original 'Seattle six-pack' of dogs who moved to Montana with us. Libby was the victim of two separate animal cruelty cases in Shelton, Washington -- two different owners abused her -- and both ended up being prosecuted. With that track record the animal control shelter didn't want to adopt her out locally (they had inadvertently adopted her out to the second abuser, after rescuing her from the first one) and asked if we could take her. Her only 'disability' is, um, a case of obesity. This is a flattering photo, trust me. And that's what I captured with the camera this evening! Everything You Always Wanted To Know But Were Afraid To Ask About ... Dog Poop! That's wobbly Allie in the foreground, but what are those things behind her? You're looking at our new compost bins! While we have always composted the horse manure and then spread it on our pastures as a soil amendment, we never thought it was 'okay' to compost dog poop and apply it the same way. So every week we've scooped the poop, bagged it, and hauled it to the dump. In winter this is particularly unpleasant, because we end up scooping snow and ice along with the poop, and if the temperature rises above freezing the bags get full of melted poop water, the bags spring a leak, and ... you can figure out the rest. About a month ago Kathryn asked, "WHY can't we compost dog waste?" We talked about all the things we remembered reading and hearing about it, but concluded we should do some research. Lo and behold, Kathryn found a new guide to composting dog waste published by the Natural Resources Conservation Service (NRCS), part of the U.S. Department of Agriculture. This report was published in December 2005 by the NRCS office in Fairbanks, Alaska. Because of all the sled dogs in Alaska, dog waste is a big problem there -- 20 million pounds of dog poop produced each year in Fairbanks and Anchorage alone! The NRCS report was based on a study that involved several mushers and dog kennels in Alaska. The research showed that composting dog poop was not only safe and effective, but resulted in a product that you could indeed use to improve the soil, just as we do with the composted horse manure. (But you still wouldn't want to use the composted dog poop on food crops for human consumption.) 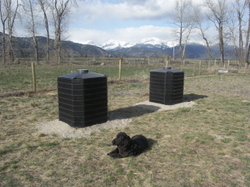 The NRCS how-to guide says that "Composting dog waste is a simple and inexpensive method for disposing of dog waste that can enhance the environment and reduce the amount of waste deposited in landfills." The caveat here is that the report says "It takes at least 10 dogs, preferably 20, to generate enough waste to maintain a bin." Well, that isn't a problem for us! Next it was my turn to research compost bins on the market. I found the ones we needed at a place called Green Culture and ordered them. That's what you see in the photo. Interestingly, the literature that came with the bins said we shouldn't compost dog waste! Finally, one bit of trivia to leave you with, just in case you ever really wanted to know: The average dog generates 274 pounds of poop per year. There you have it. 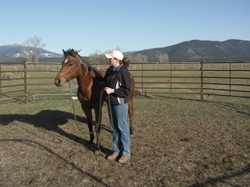 Our big handsome boy blind Buddy was adopted today by Susan S. from Missoula. Susan had come out on Monday to meet Buddy for the first time and introduce him to her other dog, a very small girl named Dalai. Susan decided Buddy was just perfect, and Dalai seemed to think Buddy was just her type. So Susan came back today to pick him up and take him home. Susan added, "He LOVES his new crate. After he explored the yard a bit I showed him where his crate was and he already knows exactly where it is. When I gave him a biscuit he took it right in the crate to eat. He also likes his new hedgehog toy and tennis ball -- he's played with the ball a bit but always takes it back in his crate." 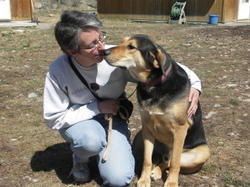 I took the photo this afternoon of Susan with Buddy, just before they left for Missoula. Thank you, Susan, for adopting this wonderful boy! 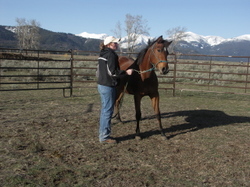 About a year ago we realized we had a very remarkable foal on our hands in the form of Nikki. Incredibly smart, calm, easy-going and -- dare I say it -- gorgeous, too. A dream foal, except for one small problem. She was blind. Her first few months of life had been rough, but by the time she was a year old, she had blossomed into an adorable young horse who awed visitors with her ability to buck and kick and whirl around her corral, and never run into a thing. Nikki would race right up to the corral fence, hit the brakes, and stop a foot from the panel. Then she would pivot with athletic grace and take off like a flash to the fenceline on her right, coming to a dead stop -- again -- just a foot from the corral panel. People would ask us, "Is she really blind?" Thus it began to dawn on us last spring that when she turned two this year, we should begin training her for under the saddle. We wanted to find out what she could do and how far we could take her. Last December we interviewed and hired a trainer named Nichole Zupan. Nichole went to college on a rodeo scholarship, majored in equine studies, and was experienced in starting colts. Just as important to us, Nichole showed a real interest in working with a blind horse. As it turned out, Nichole lives just 20 minutes from the ranch, making it very easy and convenient for her to come out a couple of times a week. We agreed that when the snows finally melted and we had bare ground, Nikki's training would begin. To give you a better sense of the ground work, I also shot some video of this first training session. It was very breezy, and although I didn't realize it at the time, the microphone picked up all the wind ... so that's pretty much the only audio you hear on this video ... sorry! Except Nikki does get a word in at the very end. Evelyn and I left the ranch late this afternoon and headed to Spokane, Washington. 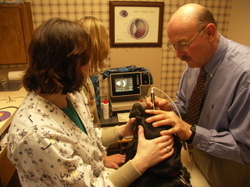 Evelyn has an appointment with our veterinary ophthalmologist, Dr. Bill Yakely, on Monday morning. 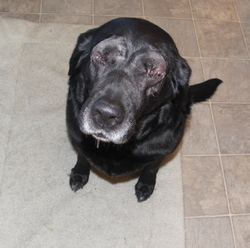 For this sweet blind Lab, it's also a trip home in a way -- she originally came to us from Spokane Animal Control. I took the photo this evening when we arrived at the hotel where we're staying. I learned on my first stop on this trip that whenever I get out of the truck, Evelyn immediately -- and I do mean immediately, because I barely have the door closed before she does this -- climbs from the back seat into the driver's seat. 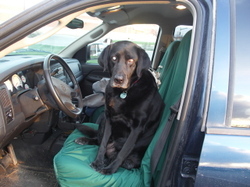 Of course, she can go from back seat to front seat in an instant, but somehow just can't figure out how to go in reverse. Hmm. Evelyn is blind from cataracts, but she also now has detached lenses. Just recently the lens in her left eye ended up pressing against the back of the cornea, causing irritation and inflammation in that eye. The lens in her right eye is still floating in the fluid inside the eye. 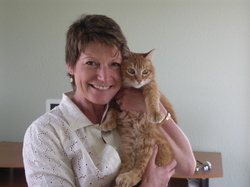 Our vet in Helena, Dr. Brenda Culver, evaluated Evelyn last week and recommended we take her to Dr. Yakely. We don't know yet what the outcome will be. Evelyn will have an electroretinogram (ERG) first, which will determine whether her retinas are still firing and if so, to what degree. The ERG results will dictate what kind of surgery she has. Evelyn might have lens extraction surgery in one or both eyes, or we might have to remove one or both eyes. If her retinas are still functioning normally, it's possible ... just maybe ... she might wind up with some ability to see again. I'm nervous about it, she's not. Evelyn is sacked out on the hotel room floor as I write this. When I took her for her first walk this evening, she did her trademark 'happy girl' routine ... she found just the right patch of grass and rolled around on her back, woofing with delight.